Departing from Longyearbyen on June 1, 2019, prices starting at $5,795. Quark Expeditions’ new and improved polar expedition ship Ocean Adventurer recently underwent a multi-million-dollar renovation and is designed to carry 132 travelers in comfort to the most remote corners of the world. This nimble, ice-strengthened ship has become a passenger favourite over the years and is a recipient of the 2017 Travel Weekly Magellan Award for Overall Small Cruise Ship (500 passengers or under). A Triple Cabin has two lower berths and one upper berth, private facilities, and a porthole with exterior views. 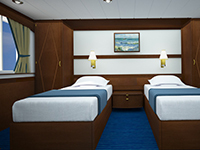 A Lower Deck Twin cabin has two lower berths, private facilities, and a porthole with exterior views. A Main Deck Twin Porthole cabin has two lower berths, private facilities, and a porthole with exterior views. A Main Deck Twin Window cabin has two lower berths, private facilities, and two windows with exterior views. 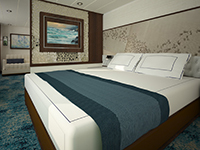 A Superior cabin has two lower berths, private facilities, and windows with exterior views. Averaging 182 sq. ft., a Deluxe Cabin has two lower berths, private facilities, and windows with exterior views. A Suite has two lower berths, windows with exterior views, private facilities. Cabin 403 has a bathtub other Suites have showers. Approximately 289 sq. ft. in size (27 sq. m), these cabins all feature a private sitting room. One features a large panoramic window facing aft, and the other two suites face port and starboard.